от 300 шт. — 104 руб. от 600 шт. — 101 руб. Добавить в корзину 100 шт. на сумму 10 500 руб. 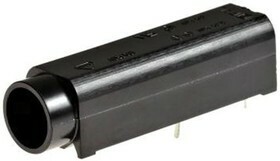 Schurter FAU series shock-safe PCB mount fuse holders for 5 x 20 or 6.3 x 32 mm cartridge fuses. The FAU series has a thermoplastic body with tin-plated copper alloy terminals that make this range suitable for industrial or domestic use.